To hear the liberal denunciations of the proposed American Health Care Act — House Speaker Paul Ryan's plan to replace Obamacare — you would think the GOP had set out to wreck a brilliant and much-loved social reform that Americans couldn't imagine living without. Democratic leaders in Congress have slammed the Republican legislation as a plan to "Make America Sick Again," and to wreak, in Nancy Pelosi's words, "massive damage to millions of families across the nation." The AARP, an influential pressure group that claims to represent older Americans, has launched a high-profile campaign against the bill on social media, by video, and in an open letter to lawmakers. AARP warns that the Republicans' health care overhaul "raises premiums and weakens Medicare" and would "dramatically increase health care costs for Americans aged 50-64." Well, yes and no. The Ryan plan is indeed deeply flawed. Not because it obliterates Obamacare — but because it doesn't. This is only the latest turn in a long saga of health care "reforms" that have constricted choice, disempowered consumers, banished price awareness, eliminated competition, and discouraged innovation. The results are all around us: skyrocketing medical costs, mounting economic pressures on employers, employees, doctors, and patients — and a political obsession with providing insurance, rather than with producing good health. It would take a miracle for Congress to find the courage to pull up the whole misbegotten system by its roots. But the payoff would be even more miraculous. 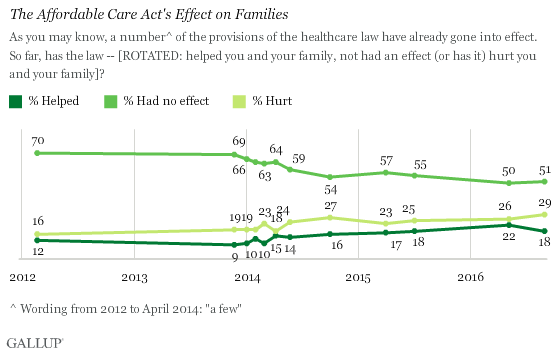 From Day 1, Obamacare was relentlessly unpopular. Republicans surged to one political triumph after another by vowing to get rid of it. Some libertarians and free-market conservatives, to their credit, have spurned the leadership bill as nothing more than Obamacare Lite. But many weak-kneed GOP moderates have been spooked by the assault from liberals, especially after the Congressional Budget Office prediction that ending Obamacare would mean 24 million more people without health insurance. There is good reason to doubt the CBO's conclusions — its previous coverage estimates have routinely turned out wrong — but Democrats and their allies are flogging them with enthusiasm, raising alarums about the catastrophe to come if Obamacare is dismantled. Yet many in the GOP are now waffling because they fear the political costs of doing anything else. They would like to get rid of the mandates, taxes, and regulations that the public has never liked, but can't bring themselves to scrap the law's popular benefits and entitlements. They don't want to be held accountable for not allowing young adults to stay on their parents' insurance plans until age 26. They don't want to face the outrage that will follow when insurers charge higher premiums to customers with pre-existing conditions. "Republicans want medicine to be inexpensive and effective," commentator Mark Humphrey writes, "but they do not want to repeal the morass of regulations that make it expensive and ineffective. Just so. But they can't have one without the other — and without braving the political storms that have made such chaos of America's health care and health insurance landscape. If Republicans were serious, and willing to endure some political pain to reach a better outcome, they'd eliminate the tax deduction for employers who provide health insurance as part of employee compensation. They'd repeal laws that force insurers to cover a legislated array of medical benefits and treatments. They'd remove the barriers that restrict consumers in one state from purchasing health insurance across state lines. And they'd break the destructive habit of treating health insurance as the logical and preferable way to pay for routine health care. Were members of Congress to enact all that, they would be replacing a dysfunctional, expensive, and coercive environment with something vastly better: a robust, competitive market focused on the interests of consumers — not on the demands of the insurance cartel and the political class. They would be restoring the price transparency that has long been missing from health care. They would be encouraging medical providers and insurers to compete in earnest — which would inevitably lower prices and improve quality. They would be de-linking medical coverage from employment, and endowing tens of millions of Americans with the economic leverage that comes with choosing for themselves what policies they will buy and from whom. And they would be ending the crazy distortions caused by using health insurance to pay for regular, ordinary expenses — something we would never think of doing with automobile or homeowner's insurance. Instead of solving the system's problems, Obamacare only entrenched them. While Democrats portray repeal of the Affordable Care Act as an assault on baseball, hot dogs, apple pie, and Chevrolet, Republicans ought to be reminding voters how Obamacare played out in real life: reminding them, for instance, that it hurt more families than it helped. That it saddled insurers with losses so massive they were forced to pull out of many state exchanges. That it forced millions of Americans off their existing health plans. That it fueled double-digit annual increases in premiums. That it added billions to the national debt. Since 2010, Republicans have been swearing up and down that they would scrap Obamacare. The way to do that is to scrap Obamacare. Scrap the subsidies, the community-rating rules, and the guaranteed-issue requirements. Scrap the employer mandates and the individual tax penalties. Scrap the "slacker mandate" for those 26 and under. Scrap the guarantee of coverage for pre-existing conditions.